ARE YOU in the miserable state of sin? Then call on the divine  Mary and say to her: Ave, which means "I salute thee with the most profound respect, thou who art without sin" and she will deliver you from the evil of your sins. Are you groping in the darkness of ignorance and error? Go to Mary and say to her: Hail Mary; which means "Hail thou who art bathed in the light of the Sun of Justice"----and she will give you some of her light. Are you all alone, having lost God's protection? Pray to Mary, and say: "The Lord is with thee----and this union is far nobler and more intimate than that which He has with Saints and the just----because thou art one with Him. 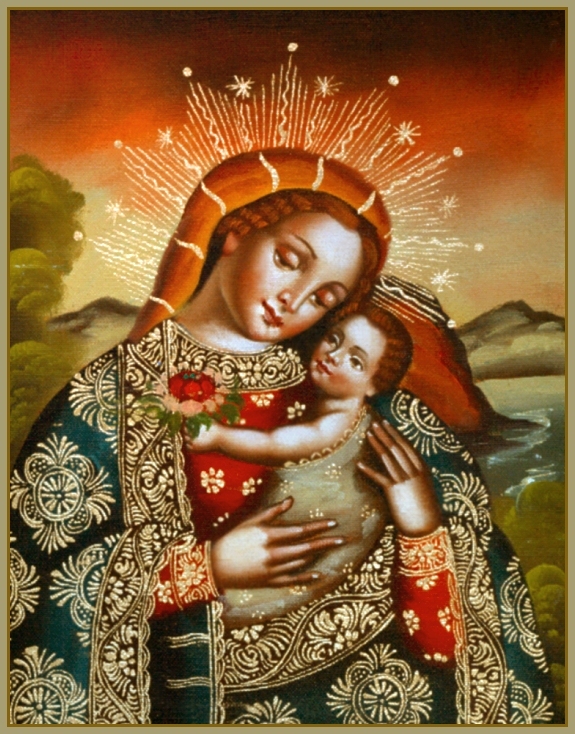 He is thy Son and His Flesh is thy flesh; thou art united to the Lord because of thy perfect likeness to Him and by your mutual love----for thou art His Mother." And then say to her: "The Three Persons of the Godhead are with thee because thou art the Temple of the Most Blessed Trinity," and she will place you once more under the protection and care of Almighty God. So fraught with sorrow and uncertainty. By powerful and ruthless enemies . . .
To ensnare us and cast us into perdition. And do not forsake us there. In the realm of everlasting glory. No one could help admiring the beauty of the Holy Rosary which is made up of two heavenly things: the Lord's Prayer and the Angelic Salutation. How could there possibly be any prayers more pleasing to Almighty God and the Blessed Virgin, or any that are easier, more precious or more helpful than these two prayers? We should always have them in our hearts and on our lips to honor the Most Blessed Trinity, Jesus Christ our Savior, and His Most Holy Mother. In addition, at the end of each decade it is very good to add a Gloria Patri  . . . that is to say: "Glory be to the Father, and to the Son, and to the Holy Spirit. As it was in the beginning, is now, and ever shall be, world without end. Amen." 1. " . . . the word divine may be used without attributing the nature of Divinity to the person or thing thus qualified. We speak of our own prayers, whether addressed to God or to His Saints, as a divine service. The Psalmist speaks of us all as being gods and sons of the Most High; and yet no one takes offense, because the sense given to the words uttered is understood. Mary may be called divine because Divinely chosen for the divine office of Mother of a Divine Person, Jesus Christ (Cardinal Vaughan, preface to "True Devotion to the Blessed Virgin Mary" by St. Louis de Montfort)." 2. The "Gloria Patri" was a happy innovation in the recitation of the Rosary. It is quite probably that it can be attributed to Saint Louis de Montfort himself.